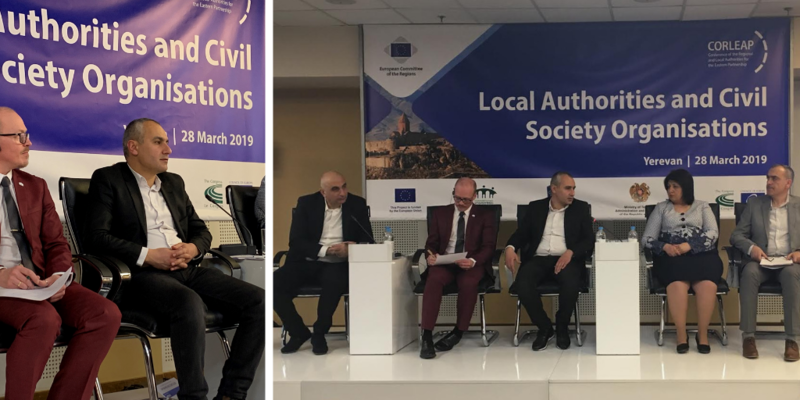 On 28 March 2019, Eastern Partnership Civil Society Forum (EaP CSF) took part in 14th CORLEAP – Conference of the Regional and Local Authorities for the Eastern Partnership Bureau meeting in Yerevan, Armenia. Speaking on behalf of EaP CSF, Abraham Artashesyan (CFOA – Communities Finance Officers Association of Armenia) presented the case for enabling environment for citizen participation within local and regional authorities, taking into account the opportunities provided by existing EU-EaP framework. Other panellists included Naira Arakelyan (Armavir Development Center, Armenia), another EaP CSF member. Jointly organised by Committee of the Regions (CoR), Union of Armenian Communities, Armenian Ministry of Territorial Administration and Development and Congress of the Council of Europe (CoE), the meeting brought together local authorities and civil society organisations, working on the region. Most of the discussions revolved around contact exchange across borders and capacity-building, as well as learning from shared experiences – especially in the ambit of public administration. The meeting closed with a debate on how to strengthen informal, civil society networks and respond to future challenges.